37 C.F.R. 1.114 Request for continued examination. (b) Prosecution in an application is closed as used in this section means that the application is under appeal, or that the last Office action is a final action (§ 1.113 ), a notice of allowance (§ 1.311), or an action that otherwise closes prosecution in the application. (c) A submission as used in this section includes, but is not limited to, an information disclosure statement, an amendment to the written description, claims, or drawings, new arguments, or new evidence in support of patentability. If reply to an Office action under 35 U.S.C. 132 is outstanding, the submission must meet the reply requirements of § 1.111. (d) If an applicant timely files a submission and fee set forth in § 1.17(e), the Office will withdraw the finality of any Office action and the submission will be entered and considered. If an applicant files a request for continued examination under this section after appeal, but prior to a decision on the appeal, it will be treated as a request to withdraw the appeal and to reopen prosecution of the application before the examiner. An appeal brief (§ 41.37 of this title) or a reply brief (§ 41.41 of this title), or related papers, will not be considered a submission under this section. (6) A patent under reexamination. 35 U.S.C. 132(b) provides for continued examination of an application at the request of the applicant (request for continued examination or RCE) upon payment of a fee, without requiring the applicant to file a continuing application under 37 CFR 1.53(b). To implement the RCE practice, 37 CFR 1.114 provides a procedure under which an applicant may obtain continued examination of an application in which prosecution is closed (e.g., the application is under final rejection or a notice of allowance) by filing a submission and paying a specified fee. Applicants cannot file an RCE to obtain continued examination on the basis of claims that are independent and distinct from the claims previously claimed and examined as a matter of right (i.e., applicant cannot switch inventions). See 37 CFR 1.145. Any newly submitted claims that are directed to an invention that is independent and distinct from the invention previously claimed will be withdrawn from consideration and not entered. See subsection VI. below. An RCE is not the filing of a new application. Thus, the Office will not convert an RCE to a new application such as an application filed under 37 CFR 1.53(b) or a continued prosecution application (CPA) under 37 CFR 1.53(d). (F) a patent under reexamination. (C) the filing of a notice of appeal to the U.S. Court of Appeals for the Federal Circuit or the commencement of a civil action (unless the appeal or civil action is terminated). See 37 CFR 1.114(a). An applicant cannot request continued examination of an application until after prosecution in the application is closed. See 37 CFR 1.114(a). Prosecution in an application is closed if the application is under appeal, or the last Office action is a final action (37 CFR 1.113 ), a notice of allowance (37 CFR 1.311 ), or an action that otherwise closes prosecution in the application (e.g., an Office action under Ex parte Quayle, 25 USPQ 74, 453 OG 213 (Comm’r Pat. 1935)). A "submission" as used in 37 CFR 1.114 includes, but is not limited to, an information disclosure statement, an amendment to the written description, claims, or drawings, new arguments, or new evidence in support of patentability. See 37 CFR 1.114(c). If a reply to an Office action under 35 U.S.C. 132 is outstanding, the submission must meet the reply requirements of 37 CFR 1.111. See 37 CFR 1.114(c). Thus, an applicant may file a submission under 37 CFR 1.114 containing only an information disclosure statement (37 CFR 1.97 and 1.98 ) in an application subject to a notice of allowance under 35 U.S.C. 151, but not in an application where the last Office action is a final rejection or an Office action under Ex parte Quayle, 25 USPQ 74, 453 OG 213 (Comm’r Pat. 1935), or in an application that is under appeal. A request for a suspension of action, an appeal brief or a reply brief (or related papers) will not be considered a submission under 37 CFR 1.114. See 37 CFR 1.103 and 1.114(d). The submission, however, may consist of the arguments in a previously filed appeal brief or reply brief, or may simply consist of a statement that incorporates by reference the arguments in a previously filed appeal brief or reply brief. In addition, a previously filed amendment after final (whether or not entered) may satisfy this submission requirement. Arguments submitted after final rejection, which were entered by the examiner but not found persuasive, may satisfy the submission requirement if such arguments are responsive within the meaning of 37 CFR 1.111 to the Office action. Consideration of whether any submission is responsive within the meaning of 37 CFR 1.111 to the last outstanding Office action is done without factoring in the "final" status of such outstanding Office action. Thus, a reply which might not be acceptable as a reply under 37 CFR 1.113 when the application is under a final rejection may be acceptable as a reply under 37 CFR 1.111. After Final Must include a reply under 37 CFR 1.111 to the final rejection (e.g., an amendment filed with the RCE or a previously-filed after final amendment). See subsections V. and VI. After Ex Parte Quayle action Must include a reply to the Ex Parte Quayle action. See subsection IX. After allowance Includes, but not limited to, an IDS, amendment, new arguments, or new evidence. See subsection IX. After appeal Must include a reply under 37 CFR 1.111 to the final rejection (e.g., a statement that incorporates by reference the arguments in a previously filed appeal brief or reply brief). See subsections X., XI., and XII. (H) the RCE included a submission as required by 37 CFR 1.114. If one or more conditions for filing an RCE have not been satisfied, applicant will be so notified. Generally, a "Notice of Improper Request for Continued Examination (RCE)," Form PTO-2051, will be mailed to applicant. An improper RCE will not operate to toll the running of any time period set in the previous Office action for reply to avoid abandonment of the application. If an examiner discovers that an improper RCE has been forwarded to the examiner in error, the application should be immediately returned to a head supervisory legal instruments examiner (HSLIE) within the TC. If prosecution in the application is not closed, applicant will be notified of the improper RCE and any amendment/reply will be entered. Thereafter, the application will be forwarded to the examiner for consideration of the amendment/reply under 37 CFR 1.111. If the application is under appeal and the RCE was not accompanied by the fee set forth in 37 CFR 1.17(e) and/or a submission as required by 37 CFR 1.114, the application will be forwarded to the examiner for appropriate treatment and applicant will be notified of the improper RCE (See subsection X below). If an applicant files a transmittal paper that is ambiguous as to whether it is a continued prosecution application (CPA) under 37 CFR 1.53(d) or a request for continued examination (RCE) under 37 CFR 1.114 (e.g., contains references to both an RCE and a CPA), and the application is a plant or utility application filed on or after June 8, 1995, the Office will treat the transmittal paper as an RCE under 37 CFR 1.114 since effective July 14, 2003, CPA practice has been eliminated as to plant and utility applications. If an applicant files a transmittal paper that is ambiguous as to whether it is a CPA or an RCE, and the application is a design application, the Office will treat the transmittal paper as a request for a CPA under 37 CFR 1.53(d) since RCE practice does not apply to design applications. Other papers filed with the transmittal paper (e.g., a preliminary amendment or information disclosure statement) will not be taken into account in determining whether a transmittal paper is a CPA, or an RCE, or ambiguous as to whether it is a CPA or an RCE. If, however, applicant files an unambiguous transmittal paper that is an RCE in a design application, it will be treated as an improper RCE and a "Notice of Improper Request for Continued Examination (RCE)," Form PTO-2051, will be mailed to the applicant. An RCE is not a type of new application filing. Therefore, the Office cannot convert an RCE (whether proper or improper) to a new application such as a CPA under 37 CFR 1.53(d). If a submission is accompanied by a "conditional" RCE and payment of the RCE fee under 37 CFR 1.17(e) (i.e., an authorization to charge the 37 CFR 1.17(e) fee to a deposit account in the event that the submission would not otherwise be entered), the Office will treat the "conditional" RCE and payment as if an RCE and payment of the fee set forth in 37 CFR 1.17(e) had been filed. If the conditions for filing an RCE have been satisfied, the technical support personnel will process the proper RCE. Any previously filed unentered amendments, and amendments filed with the RCE will normally be entered. Such amendments will be entered in the order in which they were filed in the absence of any specific instructions for entry. For example, if applicant files an amendment after final rejection which is denied entry by the examiner and applicant subsequently files an RCE with an amendment but the RCE is silent as to whether or not the previously filed after-final amendment should be entered, then the Office will enter both amendments in the order in which they were filed. If, however, applicant files an amendment after final rejection which is denied entry by the examiner and applicant subsequently files an RCE with an amendment including specific instructions that the previously filed after-final amendment is not to be entered, then the Office will enter the amendment filed with the RCE but will not enter the after-final amendment. If conflicting amendments have been previously filed, applicant should clarify which amendments should be entered upon filing the RCE (and fee). Applicants are encouraged to file all amendments no later than the filing of the RCE to avoid disapproval of entry under 37 CFR 1.111(b). See MPEP § 714.03(a). If additional time is needed to prepare and file a supplement (e.g., affidavit or declaration containing test data) to the previously filed submission, applicant should consider filing a suspension of action by the Office under 37 CFR 1.103(c) with the RCE. For more details on suspension of action, see MPEP § 709. After entry of any amendments and processing of the fee(s), the application will be forwarded to the examiner. Applicant does not need to pay a fee for excess claims previously paid for prior to the filing of the RCE. Of course, new claims in excess of the number previously paid for, which are filed with the RCE or thereafter, will require payment of the appropriate fees(s) under 37 CFR 1.16. 37 CFR 1.53(d)(1) has been amended to provide that CPA practice under 37 CFR 1.53(d) does not apply to utility and plant applications. Effective July 14, 2003, a CPA may only be filed if the prior nonprovisional application is a design application. For more details on filing a CPA, see MPEP § 201.06(d). In the event that an applicant files a request for a CPA (on or after July 14, 2003) of a utility or plant application that was filed on or after June 8, 1995, the Office will automatically treat the improper CPA as an RCE of the prior application (identified in the request for CPA) under 37 CFR 1.114. If the CPA does not satisfy the requirements of 37 CFR 1.114 to be a proper RCE (e.g., lacks a submission under 37 CFR 1.114(b), or is not accompanied by the fee set forth in 37 CFR 1.17(e) ), the improper CPA will be treated as an improper RCE, and the time period set in the last Office action (or notice of allowance) will continue to run. If the time period (considering any available extension under 37 CFR 1.136(a) ) has expired, the applicant will need to file a petition under 37 CFR 1.137 (with the lacking submission under 37 CFR 1.114(b) or fee set forth in 37 CFR 1.17(e) ) to revive the abandoned application. Effective July 14, 2003, the Office will not convert an improper CPA into an application under 37 CFR 1.53(b) simply because it is requested by the applicant. The Office will convert an improper CPA into an application under 37 CFR 1.53(b) only if the applicant shows that there are extenuating circumstances that warrant the burdensome process of converting a CPA into an application under 37 CFR 1.53(b) (e.g., restoring the application to pending status and correcting the improper RCE is not possible because the application has issued as a patent). Form paragraph 7.42.15 should be used by the examiner to inform applicant that a CPA is being treated as a RCE. The request for a continued prosecution application (CPA) under 37 CFR 1.53(d) filed on  is acknowledged. A CPA may only be filed in a design application filed under 35 U.S.C. chapter 16. See 37 CFR 1.53(d)(1). Since a CPA of this application is not permitted under 37 CFR 1.53(d)(1), the improper request for a CPA is being treated as a request for continued examination of this application under 37 CFR 1.114. 1. Use this form paragraph to advise the applicant that a CPA is being treated as an RCE. 2. Also use form paragraph 7.42.04, 7.42.05, 7.42.06, or 7.42.07 as applicable, to acknowledge entry of applicant’s submission if the fee set forth in 37 CFR 1.17(e) has been timely paid. 3. If the fee set forth in 37 CFR 1.17(e) and/or a submission as required by 37 CFR 1.114 is/are missing and the application is not under appeal, a Notice of Improper Request for Continued Examination should be mailed. If the application is under appeal and the fee set forth in 37 CFR 1.17(e) and/or submission is/are missing, this form paragraph should be followed with one of form paragraphs 7.42.10 - 7.42.14, as applicable. If an applicant timely files an RCE with the fee set forth in 37 CFR 1.17(e) and a submission that meets the reply requirements of 37 CFR 1.111, the Office will withdraw the finality of any Office action to which a reply is outstanding and the submission will be entered and considered. See 37 CFR 1.114(d). The submission meeting the reply requirements of 37 CFR 1.111 must be timely received to continue prosecution of an application. In other words, the mere request for, and payment of the fee for, continued examination will not operate to toll the running of any time period set in the previous Office action for reply to avoid abandonment of the application. Any submission that is an amendment must comply with the manner of making amendments as set forth in 37 CFR 1.121. See MPEP § 714.03. The amendment must include markings showing the changes relative to the last entered amendment. Even though previously filed unentered amendments after final may satisfy the submission requirement under 37 CFR 1.114(c), applicants are encouraged to file an amendment at the time of filing the RCE that incorporates all of the desired changes, including changes presented in any previously filed unentered after final amendments, accompanied by instructions not to enter the unentered after final amendments. See subsection VI for treatment of not fully responsive submissions including noncompliant amendments. If the RCE is proper, form paragraph 7.42.04 should be used to notify applicant that the finality of the previous Office action has been withdrawn. A request for continued examination under 37 CFR 1.114, including the fee set forth in 37 CFR 1.17(e), was filed in this application after final rejection. Since this application is eligible for continued examination under 37 CFR 1.114, and the fee set forth in 37 CFR 1.17(e) has been timely paid, the finality of the previous Office action has been withdrawn pursuant to 37 CFR 1.114. Applicant’s submission filed on  has been entered. 1. Use this form paragraph if a request for continued examination (RCE), including the fee set forth in 37 CFR 1.17(e) and a submission, was filed after a final rejection. 2. In bracket 1, insert the date(s) of receipt of the submission. The submission may be a previously filed amendment(s) after final rejection and/or an amendment accompanying the RCE. As set forth in 37 CFR 1.114, a submission may include an information disclosure statement, an amendment to the written description, claims, or drawings, new arguments, or new evidence in support of patentability. If a reply to the Office action is outstanding the submission must meet the reply requirements of 37 CFR 1.111. Use instead form paragraph 7.42.08 if the submission does not comply with 37 CFR 1.111. Arguments which were previously submitted in a reply after final rejection, which were entered but not found persuasive, may be considered a submission under 37 CFR 1.114 if the arguments are responsive within the meaning of 37 CFR 1.111 to the outstanding Office action. If the last sentence of this form paragraph does not apply (e.g., the submission consists of previously entered arguments), it may be deleted or modified as necessary. If reply to a final Office action is outstanding and the submission is not fully responsive to the final Office action, then it must be a bona fide attempt to provide a complete reply to the final Office action in order for the RCE to toll the period for reply. If the submission is not a bona fide attempt to provide a complete reply, the RCE should be treated as an improper RCE. Thus, a "Notice of Improper Request for Continued Examination (RCE)," Form PTO-2051, should be prepared by the technical support personnel and mailed to the applicant indicating that the request was not accompanied by a submission complying with the requirements of 37 CFR 1.111 (see 37 CFR 1.114(c) ). The RCE will not toll the period for reply and the application will be abandoned after the expiration of the statutory period for reply if no submission complying with 37 CFR 1.111 is filed. For example, if a reply to a final Office action is outstanding and the submission only includes an information disclosure statement (IDS), the submission will not be considered a bona fide attempt to provide a complete reply to the final Office action and the period for reply will not be tolled. Similarly, an amendment that would cancel all of the claims in an application and does not present any new or substitute claims is not a bona fide attempt to advance the application to final action. The Office will not enter such an amendment. See Exxon Corp. v. Phillips Petroleum Co., 265 F.3d 1249, 60 USPQ2d 1368 (Fed. Cir. 2001). If the submission is a bona fide attempt to provide a complete reply, applicant should be informed that the submission is not fully responsive to the final Office action, along with the reasons why, and given a new shortened statutory period of two months to complete the reply. See 37 CFR 1.135(c). Form paragraph 7.42.08 set forth below should be used. (A) Non-compliant amendment - An RCE filed with a submission which is an amendment that is not in compliance with 37 CFR 1.121, but which is a bona fide attempt to provide a complete reply to the last Office action, should be treated as a proper RCE and a Notice of Noncompliant Amendment should be mailed to the applicant. Applicant is given a time period of two months from the mailing date of the notice, to provide an amendment complying with 37 CFR 1.121. See MPEP § 714.03 for information on the amendment practice under 37 CFR 1.121. (B) Presentation of claims for different invention - Applicants cannot file an RCE to obtain continued examination on the basis of claims that are independent and distinct from the claims previously claimed and examined as a matter of right (i.e., applicant cannot switch inventions). See 37 CFR 1.145. If an RCE is filed with an amendment canceling all claims drawn to the elected invention and presenting only claims drawn to a nonelected invention, the RCE should be treated as a proper RCE but the amendment should not be entered. The amendment is not fully responsive and applicant should be given a time period of two months to submit a complete reply. See MPEP § 821.03. Form paragraphs 8.04 or 8.26 should be used as appropriate. Receipt is acknowledged of a request for continued examination under 37 CFR 1.114, including the fee set forth in 37 CFR 1.17(e) and a submission, filed on . The submission, however, is not fully responsive to the prior Office action because . Since the submission appears to be a bona fide attempt to provide a complete reply to the prior Office action, applicant is given a shortened statutory period of TWO MONTHS from the mailing date of this letter to submit a complete reply. This shortened statutory period for reply supersedes the time period set in the prior Office action. This time period may be extended pursuant to 37 CFR 1.136(a). 35 U.S.C. 132(a) provides that "[n]o amendment shall introduce new matter into the disclosure of the invention." Any amendment entered pursuant to 37 CFR 1.114 that is determined to contain new matter should be treated in the same manner that a reply under 37 CFR 1.111 determined to contain new matter is currently treated. See MPEP § 706.03(o). In those instances in which an applicant seeks to add new matter to the disclosure of an application, the procedure in 37 CFR 1.114 is not available, and the applicant must file a continuation-in-part application under 37 CFR 1.53(b) containing such new matter. The action immediately subsequent to the filing of an RCE with a submission and fee under 37 CFR 1.114 may be made final only if the conditions set forth in MPEP § 706.07(b) are met. It would not be proper to make final a first Office action immediately after the filing of an RCE if the first Office action includes a new ground of rejection. See MPEP § 1207.03 for a discussion of what may constitute a new ground of rejection. Form paragraph 7.42.09 should be used if it is appropriate to make the first action after the filing of the RCE final. The phrase "withdraw the finality of any Office action" in 37 CFR 1.114(d) includes the withdrawal of the finality of a final rejection, as well as the closing of prosecution by an Office action under Ex parte Quayle, 25 USPQ 74, 453 OG 213 (Comm’r Pat. 1935), or notice of allowance under 35 U.S.C. 151 (or notice of allowability). Therefore, if an applicant files an RCE with the fee set forth in 37 CFR 1.17(e) and a submission in an application which has been allowed, prosecution will be reopened. If the issue fee has been paid, however, payment of the fee for an RCE and a submission without a petition under 37 CFR 1.313 to withdraw the application from issue will not avoid issuance of the application as a patent. If an RCE (with the fee and a submission) is filed in an allowed application prior to payment of the issue fee, a petition under 37 CFR 1.313 to withdraw the application from issue is not required. If an RCE complying with the requirements of 37 CFR 1.114 is filed in an allowed application after the issue fee has been paid and a petition under 37 CFR 1.313 is also filed and granted, prosecution will be reopened. Applicant may not obtain a refund of the issue fee. If, however, the application is subsequently allowed, the Notice of Allowance will reflect an issue fee amount that is due that is the difference between the current issue fee amount and the issue fee that was previously paid. Form paragraph 7.42.05 should be used to notify applicant that prosecution has been reopened. A request for continued examination under 37 CFR 1.114, including the fee set forth in 37 CFR 1.17(e), was filed in this application after allowance or after an Office action under Ex Parte Quayle, 25 USPQ 74, 453 OG 213 (Comm’r Pat. 1935). Since this application is eligible for continued examination under 37 CFR 1.114, and the fee set forth in 37 CFR 1.17(e) has been timely paid, prosecution in this application has been reopened pursuant to 37 CFR 1.114. Applicant’s submission filed on  has been entered. 1. Use this form paragraph if a request for continued examination (RCE), including the fee set forth in 37 CFR 1.17(e) and a submission, was filed after a notice of allowance (or notice of allowability) or Office action under Ex parte Quayle, 25 USPQ 74, 453 OG 213 (Comm’r Pat. 1935). 2. In bracket 1 insert the date(s) of receipt of the submission. As set forth in 37 CFR 1.114, a submission may include an information disclosure statement, an amendment to the written description, claims, or drawings, new arguments, or new evidence in support of patentability. 4. If the RCE was filed after the issue fee was paid, a petition under 37 CFR 1.313 to withdraw the application from issue must have been filed and granted. 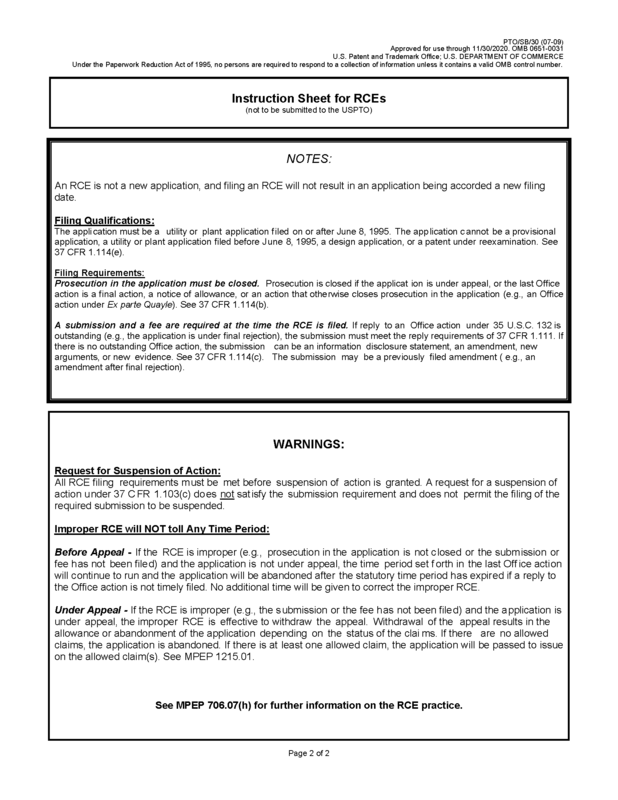 If an applicant files an RCE under 37 CFR 1.114 after the filing of a Notice of Appeal to the Patent Trial and Appeal Board (Board), but prior to a decision on the appeal, it will be treated as a request to withdraw the appeal and to reopen prosecution of the application before the examiner, regardless of whether the RCE is proper or improper. See 37 CFR 1.114(d). The Office will withdraw the appeal upon the filing of an RCE. Applicants should advise the Board when an RCE under 37 CFR 1.114 is filed in an application containing an appeal awaiting decision. Otherwise, the Board may refuse to vacate a decision rendered after the filing (but before the recognition by the Office) of an RCE under 37 CFR 1.114. 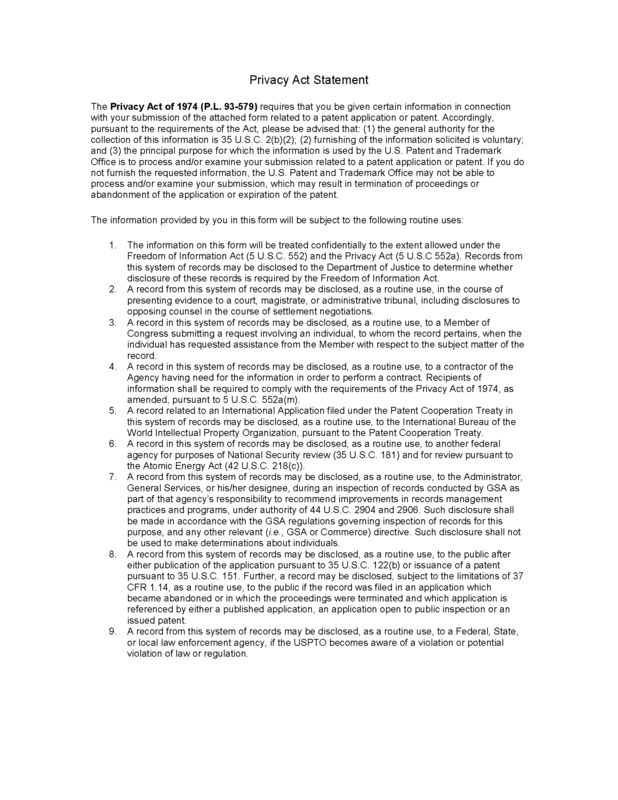 If the RCE is accompanied by a fee (37 CFR 1.17(e) ) and a submission that includes a reply which is responsive within the meaning of 37 CFR 1.111 to the last outstanding Office action, the Office will withdraw the finality of the last Office action and the submission will be entered and considered. If the submission is not fully responsive to the last outstanding Office action but is considered to be a bona fide attempt to provide a complete reply, applicant will be notified that the submission is not fully responsive, along with the reasons why, and will be given a new time period to complete the reply (using form paragraph 7.42.08). See 37 CFR 1.135(c) and subsection VI. If the RCE is proper, form paragraph 7.42.06 should be used to notify applicant that the appeal has been withdrawn and prosecution has been reopened. A request for continued examination under 37 CFR 1.114 was filed in this application after appeal to the Patent Trial and Appeal Board, but prior to a decision on the appeal. Since this application is eligible for continued examination under 37 CFR 1.114 and the fee set forth in 37 CFR 1.17(e) has been timely paid, the appeal has been withdrawn pursuant to 37 CFR 1.114 and prosecution in this application has been reopened pursuant to 37 CFR 1.114. Applicant’s submission filed on  has been entered. 1. 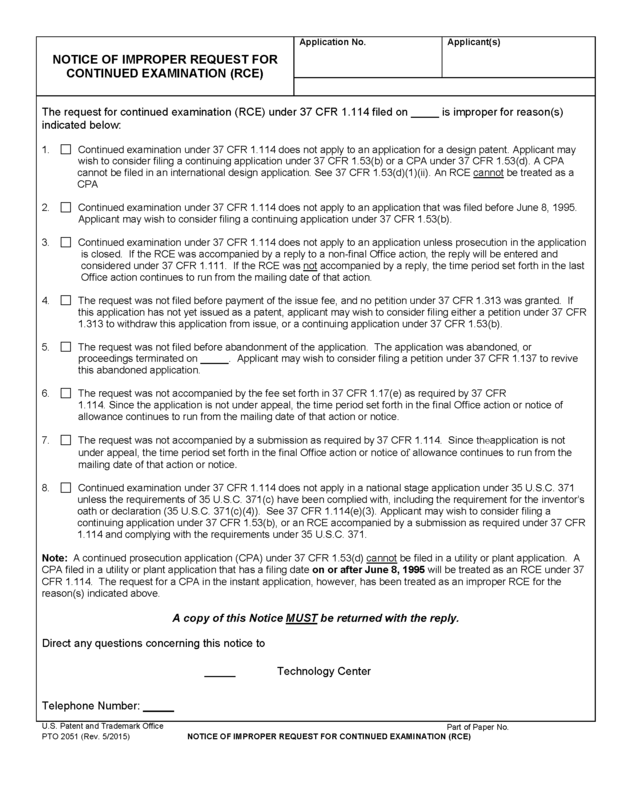 Use this form paragraph if a request for continued examination (RCE), including the fee set forth in 37 CFR 1.17(e) and a submission, was filed after a Notice of Appeal or an appeal brief, but there has not been a decision on the appeal. Note that it is not necessary for an appeal brief to have been filed. 2. As set forth in 37 CFR 1.114, a submission may include an information disclosure statement, an amendment to the written description, claims, or drawings, new arguments, or new evidence in support of patentability. The submission may consist of arguments in a previously filed appeal brief or reply brief, or an incorporation of such arguments in the transmittal letter or other paper accompanying the RCE. The appeal will be withdrawn even if the RCE is improper. If an RCE is filed in an application after appeal to the Board but the request does not include the fee required by 37 CFR 1.17(e) or the submission required by 37 CFR 1.114, or both, the examiner should treat the request as an improper RCE and withdraw the appeal pursuant to 37 CFR 1.114(d). If the submission is not considered to be a bona fide attempt to provide a complete reply to the last outstanding Office action (e.g., an IDS only), the submission will be treated as an improper submission or no submission at all under 37 CFR 1.114(c) (thus the request is an improper RCE). See subsection VI. Upon withdrawal of the appeal, the application will be treated in accordance with MPEP § 1215.01 based on whether there are any allowed claims or not. The proceedings as to the rejected claims are considered terminated. Therefore, if no claim is allowed, the application is abandoned. Claims which are allowable except for their dependency from rejected claims will be treated as if they were rejected. See MPEP § 1215.01. If there is at least one allowed claim, the application should be passed to issue on the allowed claim(s). If there is at least one allowed claim but formal matters are outstanding, applicant should be given a shortened statutory period of two months in which to correct the formal matters. Form paragraphs 7.42.10 - 7.42.14 should be used as appropriate. A request for continued examination under 37 CFR 1.114 was filed in this application on  after appeal to the Patent Trial and Appeal Board. Therefore, the appeal has been withdrawn pursuant to 37 CFR 1.114. The request, however, lacks the fee required by 37 CFR 1.17(e) and/or the submission required by 37 CFR 1.114. Since the proceedings as to the rejected claims are considered terminated, and no claim is allowed, the application is abandoned. See MPEP § 1215.01. 1. If a request for continued examination was filed after a Notice of Appeal or after an appeal brief, but before a decision on the appeal, and the request lacks the fee set forth in 37 CFR 1.17(e) or a submission or both, use this form paragraph to withdraw the appeal and hold the application abandoned if there are no allowed claims. 2. To be eligible for continued examination under 37 CFR 1.114, the application must be a utility or plant application filed under 35 U.S.C. 111(a) on or after June 8, 1995, or an international application filed under 35 U.S.C. 363 on or after June 8, 1995 that complies with 35 U.S.C. 371. The RCE must be filed on or after May 29, 2000. A request for continued examination under 37 CFR 1.114, including the fee set forth in 37 CFR 1.17(e), was filed in this application on  after appeal to the Patent Trial and Appeal Board. Therefore, the appeal has been withdrawn pursuant to 37 CFR 1.114. The request, however, lacks the submission required by 37 CFR 1.114. Since the proceedings as to the rejected claims are considered terminated, the application will be passed to issue on allowed claim. Claim been canceled. See MPEP § 1215.01. 1. If a request for continued examination, including the fee, was filed after a Notice of Appeal or after an appeal brief but before a decision on the appeal, and the request lacks the required submission, use this form paragraph to withdraw the appeal and pass the application to issue on the allowed claims. 2. In bracket 3, insert the claim number(s) of the claim(s) which has/have been canceled followed by either --has-- or --have--. Claims which have been indicated as containing allowable subject matter but are objected to as being dependent upon a rejected claim are to be considered as if they were rejected and therefore are to be canceled along with the rejected claims. See MPEP § 1215.01. 3. This form paragraph should be used with the mailing of a Notice of Allowability. 4. To be eligible for continued examination under 37 CFR 1.114, the application must be a utility or plant application filed under 35 U.S.C. 111(a) on or after June 8, 1995, or an international application filed under 35 U.S.C. 363 on or after June 8, 1995 that complies with 35 U.S.C. 371. The RCE must be filed on or after May 29, 2000. A request for continued examination under 37 CFR 1.114, including the fee set forth in 37 CFR 1.17(e), was filed in this application on  after appeal to the Patent Trial and Appeal Board. Therefore, the appeal has been withdrawn pursuant to 37 CFR 1.114. The request, however, lacks the submission required by 37 CFR 1.114. The proceedings as to the rejected claims are considered terminated, and the application will be passed to issue on allowed claim  provided the following formal matters are promptly corrected: . Prosecution is otherwise closed. See MPEP § 1215.01. Applicant is required to make the necessary corrections addressing the outstanding formal matters within a shortened statutory period set to expire TWO MONTHS from the mailing date of this letter. Extensions of time may be granted under 37 CFR 1.136. 1. If a request for continued examination, including the fee, was filed after a Notice of Appeal or an appeal brief but before a decision on the appeal, and the request lacks the required submission, use this form paragraph to withdraw the appeal if there are allowed claims but outstanding formal matters need to be corrected. 2. In bracket 3, explain the formal matters which must be corrected. A request for continued examination under 37 CFR 1.114, including a submission, was filed in this application on  after appeal to the Patent Trial and Appeal Board. Therefore, the appeal has been withdrawn pursuant to 37 CFR 1.114. The request, however, lacks the fee required by 37 CFR 1.17(e). Therefore, the submission has not been entered. See 37 CFR 1.116(c). Since the proceedings as to the rejected claims are considered terminated, the application will be passed to issue on allowed claim. Claim been canceled. See MPEP § 1215.01. 1. If a request for continued examination, including the submission, was filed after a Notice of Appeal or an appeal brief but before a decision on the appeal, and the request lacks the required fee, use this form paragraph to withdraw the appeal and pass the application to issue on the allowed claims. A request for continued examination under 37 CFR 1.114, including a submission, was filed in this application on  after appeal to the Patent Trial and Appeal Board. Therefore, the appeal has been withdrawn pursuant to 37 CFR 1.114. The request, however, lacks the fee required by 37 CFR 1.17(e). Therefore, the submission has not been entered. See 37 CFR 1.116(c). The proceedings as to the rejected claims are considered terminated, and the application will be passed to issue on allowed claim provided the following formal matters are promptly corrected: . Prosecution is otherwise closed. See MPEP § 1215.01. Applicant is required to make the necessary corrections addressing the outstanding formal matters within a shortened statutory period set to expire TWO MONTHS from the mailing date of this letter. Extensions of time may be granted under 37 CFR 1.136. 1. If a request for continued examination, including a submission, was filed after a Notice of Appeal or an appeal brief but before a decision on the appeal, and the request lacks the fee required by 37 CFR 1.17(e), use this form paragraph to withdraw the appeal if there are allowed claims but outstanding formal matters need to be corrected. 2. In bracket 3, explain the formal matters that must be corrected. The filing of an RCE (accompanied by the fee and a submission) after a decision by the Patent Trial and Appeal Board (Board), but before the filing of a Notice of Appeal to the Court of Appeals for the Federal Circuit (Federal Circuit) or the commencement of a civil action in federal district court, will also result in the finality of the rejection or action being withdrawn and the submission being considered. The time period for filing a notice of appeal to the Federal Circuit or for commencing a civil action ends sixty-three (63) days after the date of the final Board decision. See 37 CFR 90.3 and MPEP § 1216. Thus, an RCE filed within this sixty-three day time period and before the filing of a notice of appeal to the Federal Circuit or the commencement of a civil action would be timely filed. In addition to the res judicata effect of a Board decision in an application (see MPEP § 706.03(w)), a Board decision in an application is the "law of the case," and is thus controlling in that application and any subsequent, related application. See MPEP § 1214.01 (where a new ground of rejection is entered by the Board pursuant to 37 CFR 41.50(b), argument without either amendment of the claims so rejected or the submission of a showing of facts can only result in a final rejection of the claims, since the examiner is without authority to allow the claims unless amended or unless the rejection is overcome by a showing of facts not before the Board). As such, a submission containing arguments without either amendment of the rejected claims or the submission of a showing of facts will not be effective to remove such rejection. Form paragraph 7.42.07 should be used to notify applicant that the appeal has been withdrawn and prosecution has been reopened. A request for continued examination under 37 CFR 1.114 was filed in this application after a decision by the Patent Trial and Appeal Board, but before the filing of a Notice of Appeal to the Court of Appeals for the Federal Circuit or the commencement of a civil action. Since this application is eligible for continued examination under 37 CFR 1.114 and the fee set forth in 37 CFR 1.17(e) has been timely paid, the appeal has been withdrawn pursuant to 37 CFR 1.114 and prosecution in this application has been reopened pursuant to 37 CFR 1.114. Applicant’s submission filed on  has been entered. 1. Use this form paragraph if a request for continued examination (RCE), including the fee set forth in 37 CFR 1.17(e) and a submission, was timely filed after a decision by the Patent Trial and Appeal Board but before further appeal or civil action. Generally, the deadline for filing a notice of appeal to the Federal Circuit or for commencing a civil action is sixty-three (63) days after the date of the final Board decision. See 37 CFR 90.3 and MPEP § 1216. 2. A Patent Trial and Appeal Board decision in an application has res judicata effect and is the "law of the case" and is thus controlling in that application and any subsequent, related application. Therefore, a submission containing arguments without either an amendment of the rejected claims or the submission of a showing of facts will not be effective to remove such rejection. See MPEP §§ 706.03(w) and 1214.01. If an RCE is filed after a decision by the Patent Trial and Appeal Board, but before the filing of a Notice of Appeal to the Federal Circuit or the commencement of a civil action in federal district court, and the RCE was not accompanied by the fee and/or the submission, the examiner should notify the applicant that the RCE is improper by using form paragraph 7.42.16 set forth below. If the time for seeking court review has passed without such review being sought, the examiner should include the form paragraph with the mailing of a Notice of Allowability or a Notice of Abandonment depending on the status of the claims. See MPEP § 1214.06. If the time for seeking court review remains, the examiner should include the form paragraph on a PTOL-90. No time period should be set. If a submission is filed with the RCE, but the fee is missing, the examiner should also include a statement as to whether or not the submission has been entered. In general, such a submission should not be entered. If, however, the submission is an amendment that obviously places the application in condition for allowance, it should be entered with the approval of the supervisory patent examiner. See MPEP § 1214.07. Form paragraph 7.42.16 should not be used if the application is not a utility or plant application filed under 35 U.S.C. 111(a) on or after June 8, 1995, or an international application filed under 35 U.S.C. 363 on or after June 8, 1995. In that situation, a "Notice of Improper Request for Continued Examination (RCE)," Form PTO-2051, should be prepared and mailed by the technical support personnel to notify applicant that continued examination does not apply to the application. When the time for seeking court review has passed without such review being sought, the examiner must take up the application for consideration. See MPEP § 1214.06 for guidance on the action to be taken. A request for continued examination (RCE) under 37 CFR 1.114 was filed in this application on  after a decision by the Patent Trial and Appeal Board, but before the filing of a Notice of Appeal to the Court of Appeals for the Federal Circuit or the commencement of a civil action. The request, however, lacks the fee required by 37 CFR 1.17(e) and/or the submission required by 37 CFR 1.114. Accordingly, the RCE is improper and any time period running was not tolled by the filing of the improper request. 1. This form paragraph should be used with the mailing of a Notice of Allowability or a Notice of Abandonment, as appropriate, if the time for seeking court review has passed without such review being sought, or it should be used on a PTOL-90 if time still remains. 2. This form paragraph should not be used if the application is not a utility application or a plant application filed under 35 U.S.C. 111(a) on or after June 8, 1995, or an international application filed under 35 U.S.C. 363 on or after June 8, 1995 that complies with 35 U.S.C. 371. In that situation, a "Notice of Improper Request for Continued Examination (RCE)," Form PTO-2051, should be prepared and mailed by the technical support personnel to notify applicant that continued examination does not apply to the application. 3. In general, if a submission was filed with the improper RCE in this situation, it should not be entered. An exception exists for an amendment which obviously places the application in condition for allowance. See MPEP § 1214.07. The examiner should also include a statement as to whether or not any such submission has been entered (e.g., "The submission filed with the improper RCE has not been entered."). The procedure set forth in 37 CFR 1.114 is not available in an application after the filing of a Notice of Appeal to the Federal Circuit or the commencement of a civil action in federal district court, unless the appeal or civil action is terminated and the application is still pending. If an RCE is filed in an application that has undergone court review, the examiner should bring the application to the attention of the supervisory patent examiner or a quality assurance specialist in the TC to determine whether the RCE is proper. Unless an application contains allowed claims (or the court’s mandate clearly indicates that further action is to be taken by the Office), the termination of an unsuccessful appeal or civil action results in abandonment of the application. See MPEP § 1216.01. Form PTO/SB/30, "Request for Continued Examination (RCE) Transmittal," may be used by applicant for filing a RCE under 37 CFR 1.114. 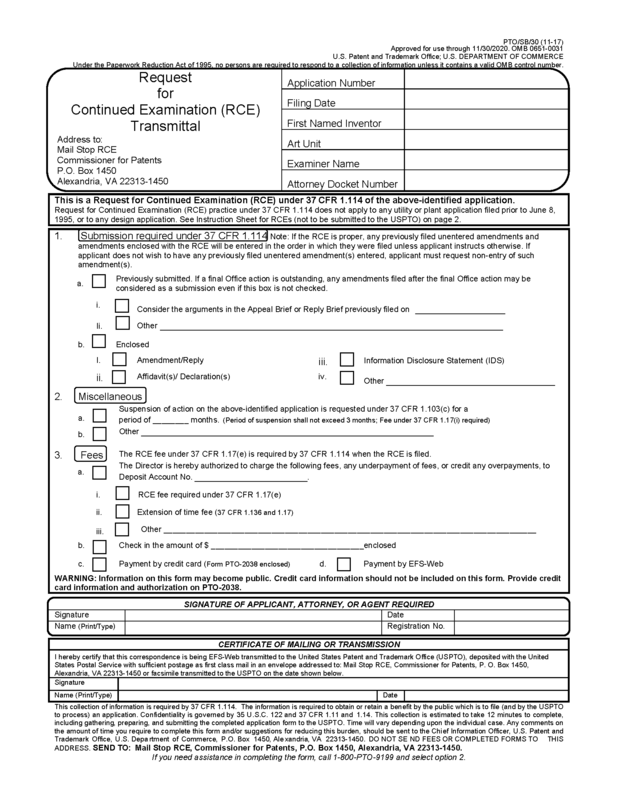 The form used by the Technology Centers to notify applicant of an improper RCE, "Notice of Improper Request for Continued Examination (RCE)," form PTO-2051, is shown below following form PTO/SB/30.